150 years of expertise for a one of a kind taste. Bacardi Thailand Brand Ambassadors showcase the eldest member of the Bacardi family; Bacardi 8 on the rocks, Bacardi 8 Old Fashioned and Bacardi 8 Daiquiri. True passion can't be tamed and Bacardi has been untamable since 1862! 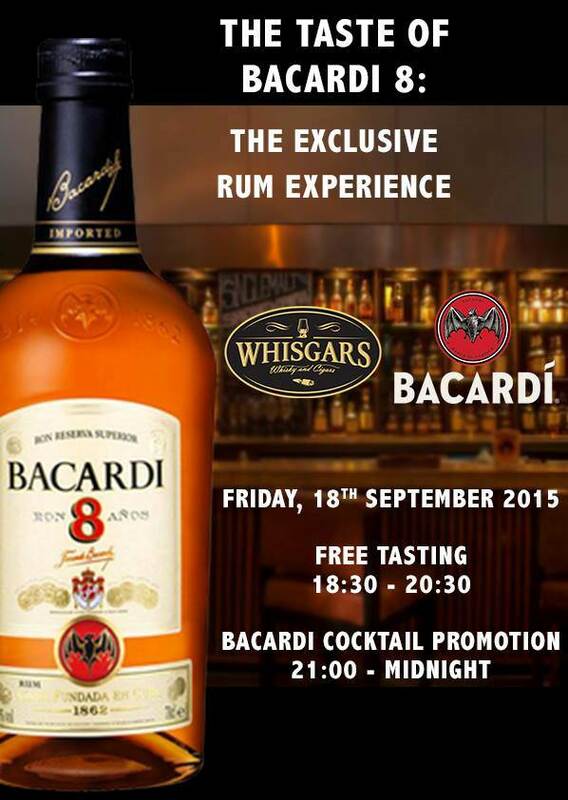 Come express your true passion with us at the “Bacardi 8” Event at Whisgars 23. Enjoy FREE ‘Bacardi 8’ Tasting with the expert from Bacardi from 6.30pm – 8.30pm as well as special promotions on ‘Bacardi 8 Cocktails’ from 9pm – 12am. We’ll also be joined by Keith Nolan from 9pm! The Deep & Mellow “Bacardi 8”was first created in 1862 and remained the sole preserve of the Bacardi family for seven generations. This golden sipping rum is one of the oldest private rum blends in the world.